What Happens in a Car Accident When No Ticket Is Issued to Either Party? If no ticket is issued to either party and there is no substantial evidence of one driver’s fault over another’s, then the insurance company will still investigate circumstances and evidence related to the crash and establish liability for the responsible party. How do you know who is at fault in a car accident? 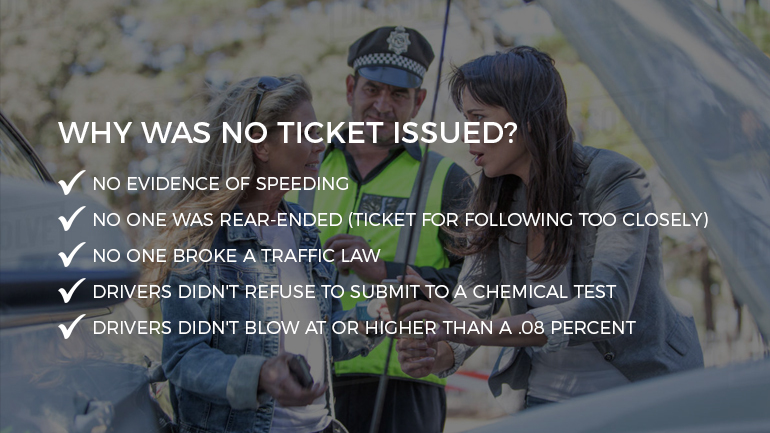 A ticket usually shows strong evidence against one driver and is especially relevant for the insurance company. The traffic ticket is issued at the scene of the accident, and it mainly reflects the investigating officer's opinion about who caused the crash. Even when a ticket is issued, if the injuries are significant, the insurance companies or the personal injury lawyers representing one party or the other will investigate the circumstances of the crash themselves. The results will be used as evidence in establishing liability by proving negligence. Most likely, a ticket was not issued because no law was broken or the officer didn't witness the violation and, therefore, wasn't able to write the citation. The lack of a ticket just reveals that, at the scene of the accident, it was not obvious who was at fault and further investigation was required to establish liability. You may be worried that if no ticket was issued you will not be able to seek a settlement for your car accident. This is not true. If you have sustained injuries there is a liable party that needs to be determined. The fact that a ticket was not issued does not mean the other driver is not at fault for the car accident. You can still pursue a claim for your injuries and damages. Whether or not you can recover compensation for your personal injuries depends on who is responsible for the car accident. Read more about how you can prove your case in our blog Case Scenario: Car Accident and No Ticket Was Issued. Miami car accident attorney Sean M. Cleary establishes fault and negligence and fights to get you the compensation you need if injured in an accident. We can guide you in what to do, as well as what not to do, following a crash. If you have been involved in an accident, contact our firm today to schedule your free consultation and review your legal options. Call 305.416.9805.